I stumbled upon Leah’s recipe here. This soup is so soup-erb that it has shot to the top spot of my FSL (Favourite Soup List)! The combination of the subtle spices from the curry paste and the sweetness of the pumpkin is a total taste festival while the cauliflower adds a wonderful smoothness and creaminess to the bowl. Garnish with some cream if you want to be fancy, but personally, I think this soup is best enjoyed in all it’s unadorned glory! Place onion into TM bowl and chop for 5 seconds on speed 7. Add butter and curry paste and sauté for 3 minutes at Varoma on speed 1. 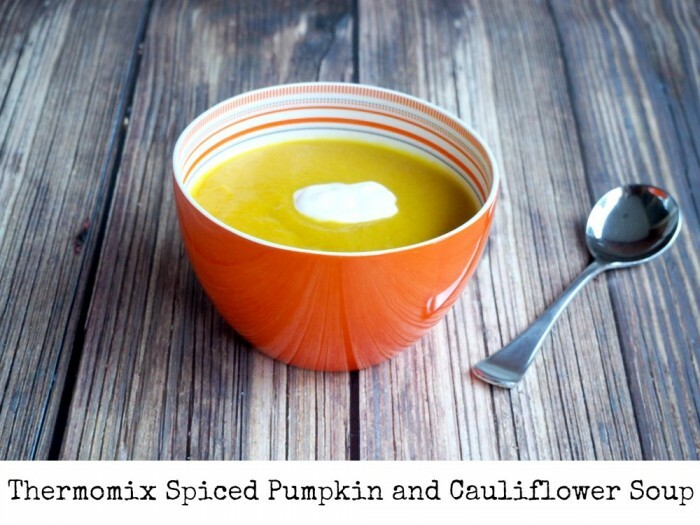 Add pumpkin and cauliflower. Chop for 15 seconds on speed 6. Add stock and water and cook for 20 minutes at 100C on speed 2. Blend slowly for 1 minute by slowly going from speed 1 to speed 9. Pour the blended soup into bowls. Serve with some cracked black pepper and a dollop of cream/sour cream if you like. TIP! Adjust the amount of water to acquire your preferred consistency.